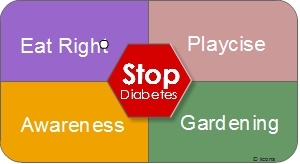 Diabetes Awareness is one of the Four Health Disciplines. The Four Health Disciplines require maintaining a daily vigilance of all possible vulnerabilities that may threaten the health of our children. Diabetes Awareness is for a parent to be constantly aware and suspicious of all external elements that might have a negative impact on their kids health. One area that represent such a threat is the commercial food industry as a source of food. Another external stimulus that represent an immediate and constant threat that is constantly tempting and programming your kids mind are TV commercials. Innocent as the snake in the infamous Garden of Eden, TV commercials is nothing more than an enticement to engage in spreading disease simply because it tastes good “What harm could a little High Fructose Corn Syrup do, the human body processes all sugars the same” sounds innocent enough, but is it? Be alert and be warned , the snake in Eden makes diabetes sound good and taste good Diabetes Awareness is 24-7. A 4-Wins Parent must exercise Diabetes Awareness 24-7. That means they are the vanguard of their kids health, not the commercial food industry, not the TV commercial industry. The TV and commercial food industries represent a threat to the health of all kids. Diabetes Awareness means monitoring what your kids are exposed to, those TV commercials and the commercial food industry and fat-cat WallStreet profiteers do not have your kids health in mind. Reduce TV time and replace it with reading time and you will start the process of de-programming your kids from all the temptation that TV commercials plant in their young brains. Actually, if you just take a moment and think about how TV and networks attack your kids brains does this border on the line of abuse? It should never have been permitted to unleash an army of corporate adults to make their living off kids by enticing children to demand foods that are harmful to their health under any circumstances, this is a shame before all those who are civilized! As mentioned earlier, TV commercials and food source represent a vulnerability and threat to your kids health. These two seemingly harmless entrenched segments of society are actually causing harm to your kids present and future health? One must be constantly aware to avoid and prevent health problems. One must be on perpetual diabetes awareness mode to protect their kids health, one must provide a 360 ring of prevention Read More about Diabetes Prevention 360. Is commercial food safe, read the statistics and facts and judge for yourself Diabetes Awareness and Food. In Draw Me Healthy gOne is super fast and hyper-energetic character. gOne has always followed the advice of his elders and eat’s only green veggies. He grows organic veggies for himself and never eat anything provided from strangers. 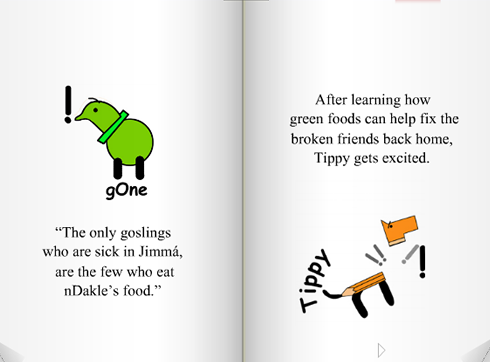 gOne explains to Tippy that other goslings that break from tradition, eat all kinds of sweet foods they obtain from other creatures in the forest, these goslings are always sick and ill.
For the first time, Tippy realize their is the connection between food and health. Tippy gets excited because he can return home with this new information that can help heal all the citizens of PencillVille-his home town. Diabetes books and stories are good to help establish morals and a stronger sense of self. The sooner you get started reading to your kids, the quicker the transformation begins. 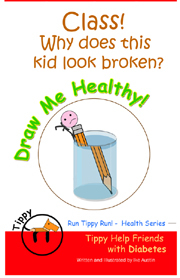 A good health book for your kids to read is the Run Tippy Run – Draw Me Healthy a diabetes health children’s book. In Run Tippy Run, gOne is a hyper fast and hyper-energetic character. gOne has always followed the advice of his elders and eats only green veggies. He grows organic veggies for himself and never eat anything provided from strangers. Where To Buy Parents can purchase the Run Tippy Run direct from the publisher, DayStarBooks $6.50.